When even the great Enzo Ferrari is moved to declare your rival product “The most beautiful car in the world” you know you’ve got something special. Even though we have now had over 50 years to get used to it, there is something so right and so perfect about the shape of the original E-Type Jaguar that its power to stop the world in its tracks remains undiminished. At least as good as any contemporary Aston or Ferrari, it's only because Jaguar sold so many of them that mere mortals like you and I can realistically think of owning one today – although prices for the ultra-desirable Series One 3.8 have been rising alarmingly of late. 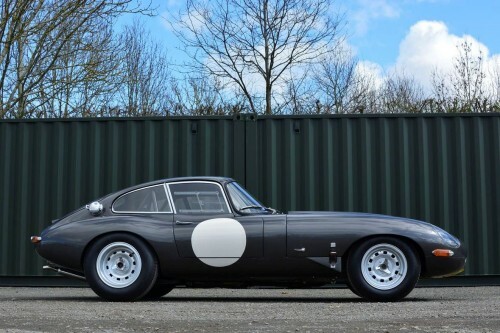 The best looking of all the E-Type variants, the first S1s had the snarling 3.8-litre XK straight-six engine which provided a much sportier feel than the later, softer 4.2-litre unit. Quoted as developing some 265bhp and 260lb/ft of torque in standard tune with a top speed nudging 150mph and disc brakes all round, it is no wonder that the car caused such a sensation when launched at the Geneva Motor Show in 1961 with a relatively affordable price tag of just £2,860. With such startling performance it is also no wonder that the E-Type began to find its way on to the world's racetracks right from the outset. In the Grand Touring class for production sportscars, the E-Type proved competitive from the start when Graham Hill, driving Tommy Sopwith's Team Endeavour car, celebrated the model\'s racing debut by winning at Oulton Park on 3rd April 1961 ahead of Innes Ireland's Aston Martin DB4GT and Roy Salvadori in John Coombs' E-Type. Since then E-Types have been raced successfully the world over, with development continuing well beyond the level achieved by Jaguar themselves. Quite apart from their sheer beauty, these remain genuinely quick cars even by today’s standards, yet are easy to live with and maintain (unlike Italian exotica) with all parts readily available and a whole army of specialists to service them. The 3.8 Coupes are also surprisingly rare, with just 7,760 made in total of which only 860 were factory right-hand drive produced between March 1961 and October 1964 (chassis numbers 860001 – 861799). This particular car is number 756 of the run and, as the accompanying Heritage Certificate confirms, it was despatched to Jaguar dealer Bearts of Kingston-upon-Thames on 8th August 1962 and was registered to first owner U Emlyn of Broad Oak, Carmarthen, just one week later. Initially registered 283 XPJ, it was originally finished in black with a red leather interior and has had just four further owners since, according to the V5C, the fourth owner acquiring it in March 1990. In the late 1990s he decided to convert the car into a semi-lightweight racer, much of the work being carried out by Jim Morse of Abingdon and subsequently by noted race engineer Bob Neville (owner of RJN Motorsport of Didcot and latterly more famous for preparing cars and drivers for the Nissan GT Academy programme). The extent of the work carried out is too detailed to list in full here but is amply documented in numerous invoices and photographs in the history file, the build cost amounting to well in excess of £40,000. The lightweight bodywork features aluminium doors made by RS Panels, an aluminium bonnet made by expert coachbuilder Simon Dunford and hand-crafted rear wheelarches inspired by those of the Malcolm Sayer-designed 'low drag' E-Type '49 FXN'. The quickly detachable tail-gate is also made of aluminium with a Perspex screen, the side windows also being made of lightweight Perspex. The car rides on magnesium replica Dunlop wheels which are shod with Dunlop Racing tyres and has a race-spec foam-filled aluminium fuel tank. Mechanically the car has been fully restored and race prepared including a full rebuild of the original engine (R5548-9), balanced and fitted with triple Weber 45DCOE carbs and Lynx inlet manifolds; a rebuilt all-syncro gearbox from a slightly later 4.2 E-Type; rebuilt rear axle and limited slip differential by Dana Spicer; fitment of a Safety Devices FIA-compliant bolt-in roll-cage; new wiring harness; Aeroquip braided hoses plus numerous other upgrades to the brakes, suspension, steering and cooling systems. Pleasingly the car still retains its original aluminium dashboard and red leather bucket seats which have a wonderful patina. The original steering wheel is also included in the sale. Due to lack of time in which to enjoy the car for the purpose it was built for, the E-Type then sat in storage for several years (apart from the odd trip to the MOT station) before being entrusted to Classic Performance Engineering of Bicester in 2015/16 for a further bout of fine tuning and race preparation at a cost of another £22,000 again detailed in worksheets and bills on file. Once these works were completed an application was sent to the Motor Sports Association for a Historic Technical Passport and the car was successfully inspected and issued with FIA Papers in February this year. Finally ready to be used in anger after many years of painstaking development, the car was booked into the Easter Monday Sprint Race at Goodwood on 28th March for its maiden outing with professional racing driver Alex Buncombe at the wheel. However, in a cruel twist of fate, Storm Katie hit Sussex on Sunday night and wreaked such havoc on the historic Goodwood circuit that the stewards were forced to call the meeting off at the last minute so the E-Type was reluctantly trailered back to base without ever having the chance to demonstrate its competition capabilities. With no time remaining before the auction to get it entered into another event, the car thus awaits a new owner to reveal its true potential at some time in the future. Freshly race prepared and fully road legal with an MOT until January 2017 with no advisories recorded, this beautiful ‘matching numbers’ E-Type has been built to an exemplary standard by some of the best names in the business and is not only eligible for various historic events but would also make a thrilling fast road car for the fortunate new owner. Please note that the V5C erroneously records the engine number as R53489 whereas the correct number is R5548-9.